June 23rd 1965: Delivered to Otto Thoresen Shipping Co A/S, Oslo, Norway. June 25th 1965: Commenced service between Southampton – Cherbourg, also Le Havre – Southampton – Cherbourg. 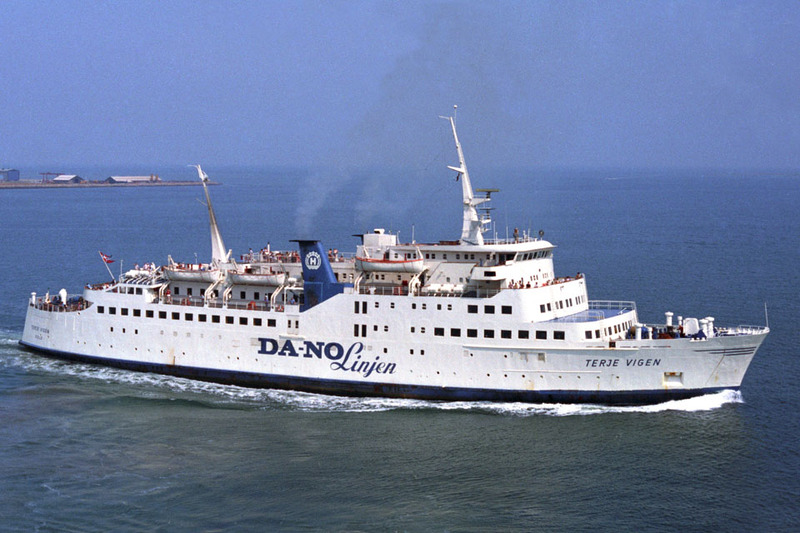 September 19th 1966 – June 1st 1967: Chartered to Lion Ferry, Halmstad. Operated between Bremerhaven – Harwich. June 1967 – September 1967: Operated between Southampton – Cherbourg/ Le Havre. September 25th 1967 – June 13th 1968: Chartered to Lion Ferry, Halmstad. Operated between Bremerhaven – Harwich. June 1968 – September 1968: Operated between Southampton – Cherbourg/ Le Havre. 1968: Registered to Thoresen Car Ferries A/S, Oslo. 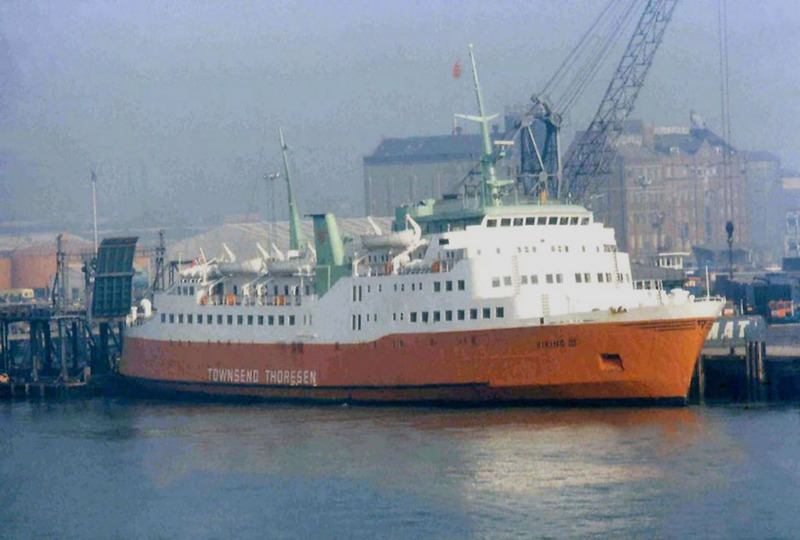 Chartered to Thoresen Car Ferries Ltd., Southampton for 20 years. September 25th 1968 – May 31st 1969: Chartered to Lion Ferry, Halmstad. Operated between Bremerhaven – Harwich. 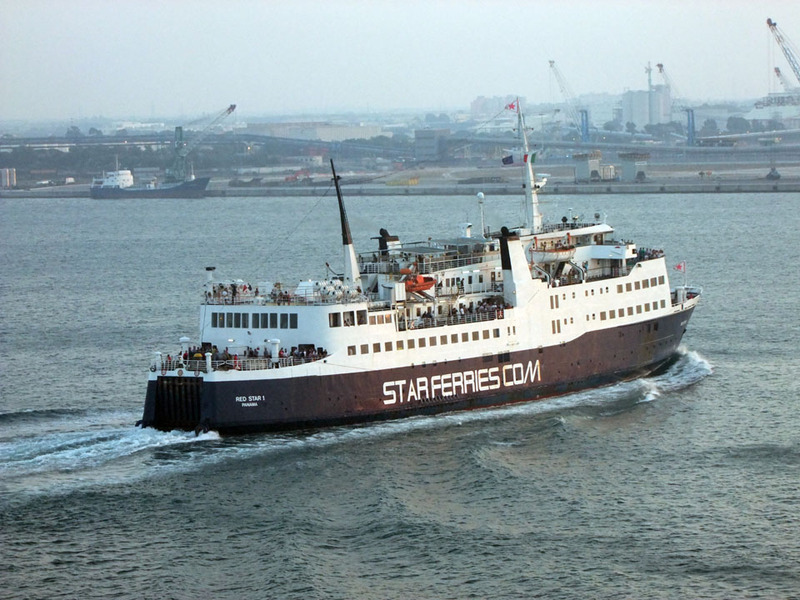 June 1969 – September 1969: Operated between Southampton – Cherbourg/ Le Havre. September 25th 1969 – May 31st 1970: Chartered to Lion Ferry, Halmstad. Operated between Bremerhaven – Harwich. 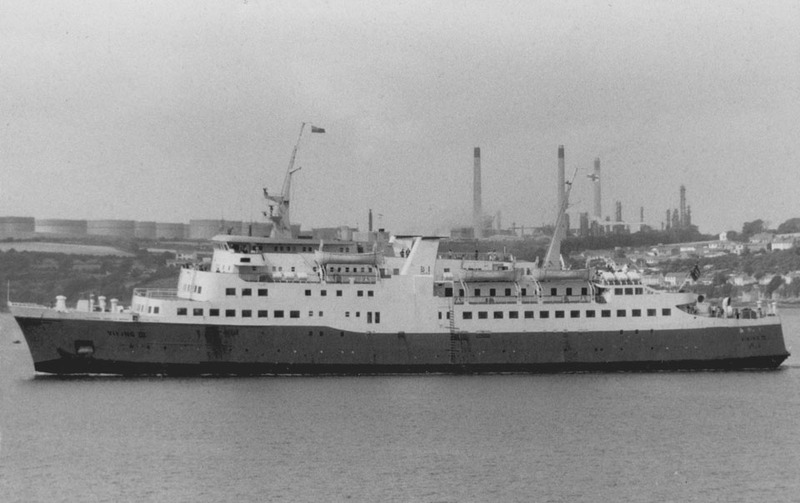 June 20th 1970: Commenced service between Southampton – Cherbourg. September 26th 1970 – May 31st 1971: Chartered to Larvik-Frederikshavnferjen A/S, Larvik, Norway. Operated between Larvik – Frederikshavn. June 15th 1971 – September 20th 1971: Operated between Southampton – Cherbourg/ Le Havre. September 29th 1971 – May 29th 1972: Chartered to Larvik-Frederikshavnferjen A/S, Larvik, Norway. Operated between Larvik – Frederikshavn. 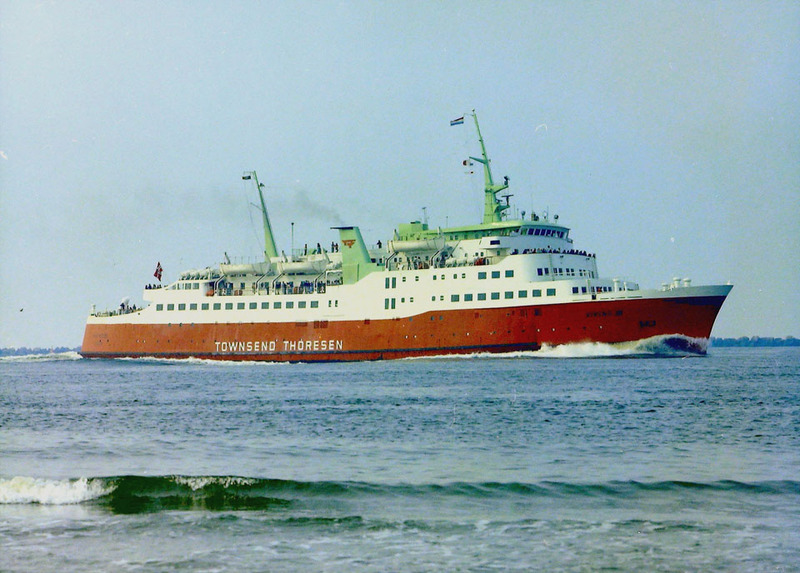 June 1972 – September 1972: Operated between Southampton – Cherbourg/ Le Havre. September 29th 1972 – May 27th 1973: Chartered to Larvik-Frederikshavnferjen A/S, Larvik, Norway. Operated between Larvik – Frederikshavn. 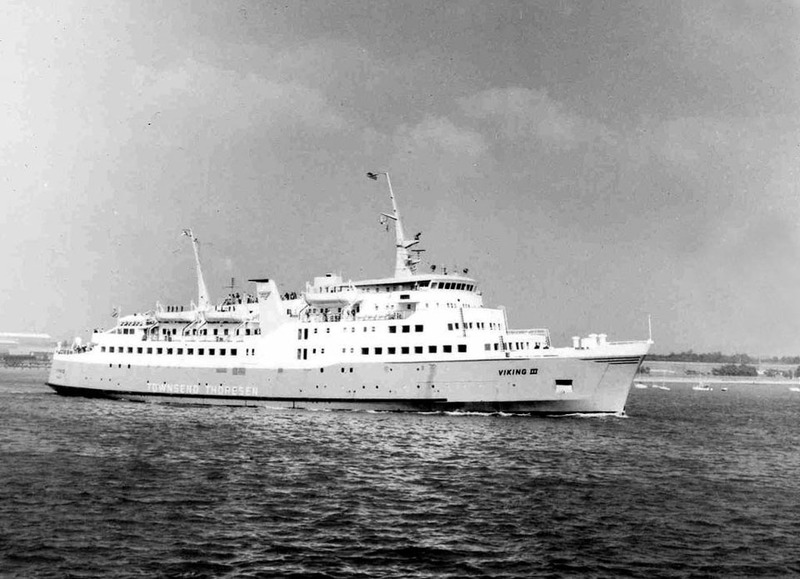 June 1973: Commenced service between Southampton – Cherbourg/ Le Havre. September 14th 1974: Used as a tender to remove passengers from the liner FRANCE which had been seized by trade unionists in Le Havre and anchored the ship in the fairway as a protest against threatened loss of their jobs. 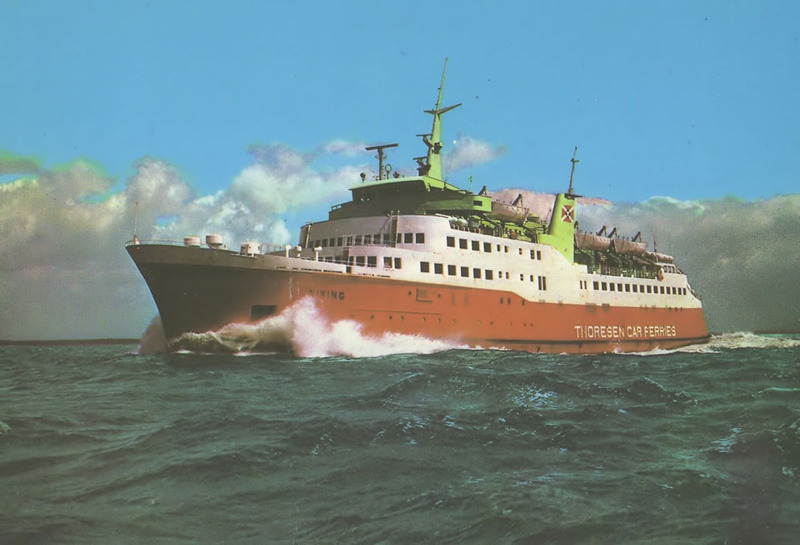 October 1975 – March 1976: Chartered to Fred Olsen, Kristiansand. 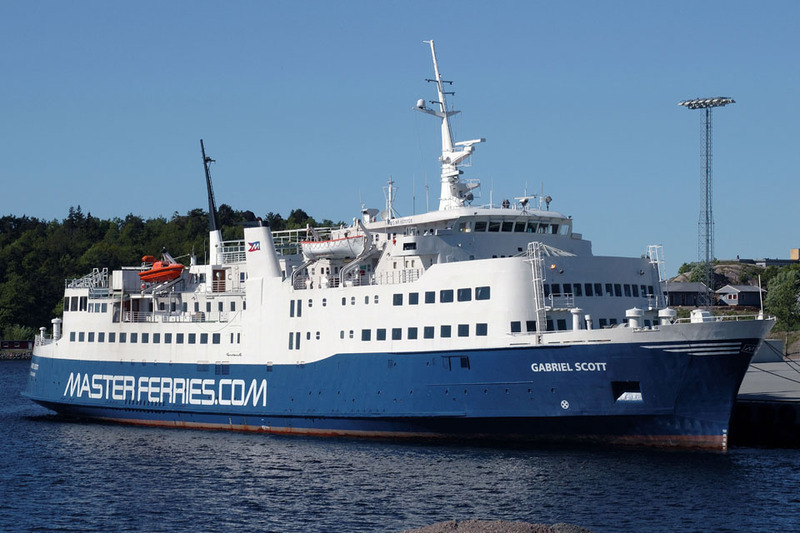 Operated between Kristiansand – Hirtshals. March 29th 1976 – April 9th 1976: Chartered to Jydsk Færgefart A/S for services between Grenå – Hundested. April 1976 – April 1977: Operated between Le Havre – Southampton – Cherbourg. May 20th 1977 – December 19th 1977: Chartered to Larvik-Frederikshavnferjen A/S, Larvik, Norway. Introduced between Larvik – Frederikshavn. March 9th 1978: Opened a new route between Felixstowe – Europoort. 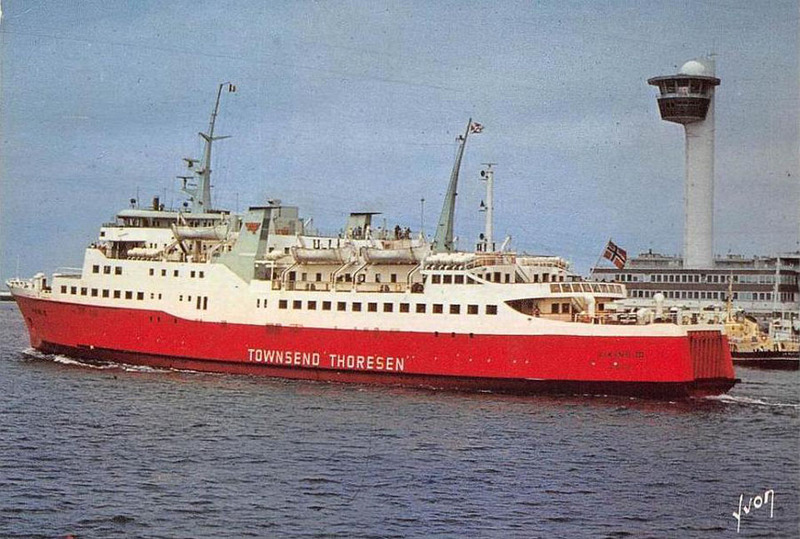 October 25th 1979 – December 29th 1979: Operated between Leith – Kristiansand for Townsend Thoresen. January 21st 1980 – February 3rd 1980: Chartered to Jydsk Færgefart A/S, Juelsminde. Operated between Juelsminde – Kalundborg. February 4th 1980 – February 26th 1980: Chartered to Jydsk Færgefart A/S. Operated between Grenå – Hundested. February 28th 1980 – March 31st 1980: Chartered to Sealink Manx Line. Operated between Douglas – Heysham. May 13th 1980 – May 20th 1980: Chartered to Sealink. 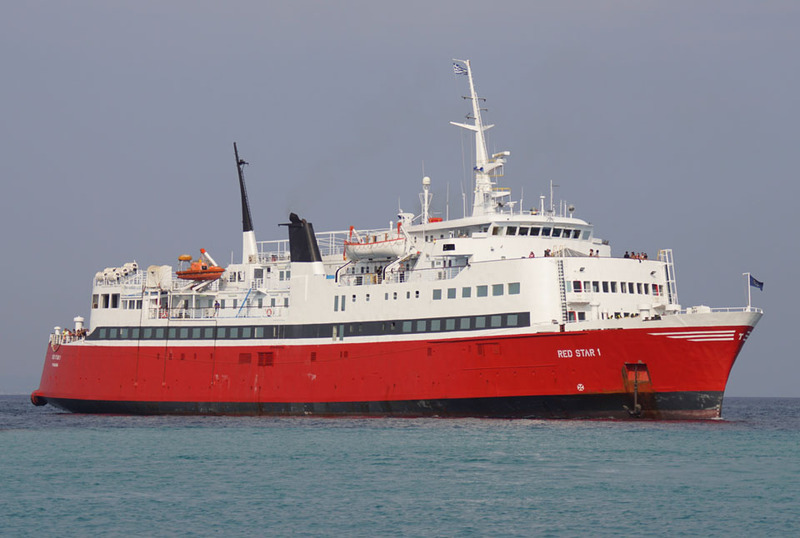 Operated between Portsmouth – Jersey – Guernsey. May 23rd 1980: Planned charter to Kalmar Line Ab for their Kalmar – Rönne didn’t materialise. May 23rd 1980: Chartered to B&I Line, Dublin, Ireland. 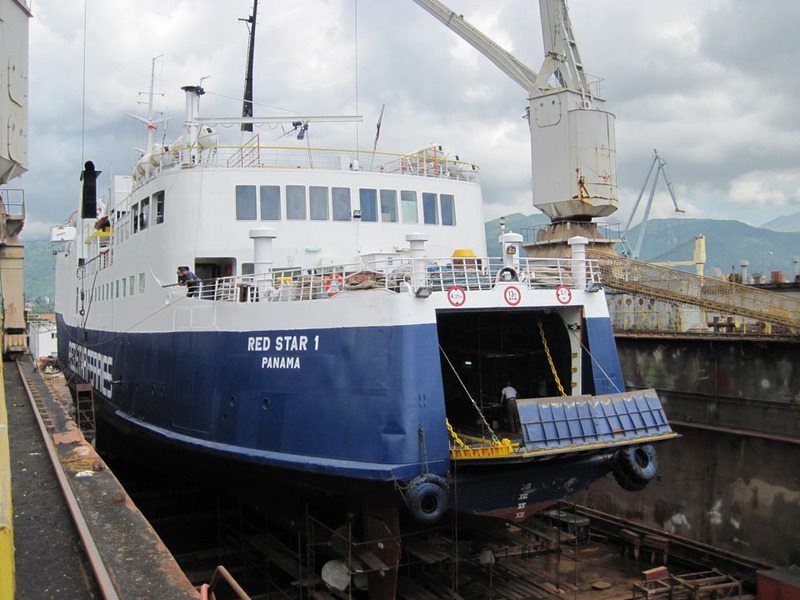 Operated between Rosslare – Pembroke Dock. 1980 (autumn): Chartered to Sealink Manx Line for services between Douglas – Heysham. January 25th 1981 – February 27th 1981: Chartered to Jydsk Færgefart A/S. Operated between Grenå – Hundested. May 13th 1981 – May 29th 1981: Chartered to Larvik-Frederikshavnferjen A/S, Larvik, Norway. Operated between Larvik – Frederikshavn. June 1st 1981 – September 14th 1981: Chartered to Fred Olsen Lines, Kristiansand, Norway. Operated between Kristiansand – Hirtshals. 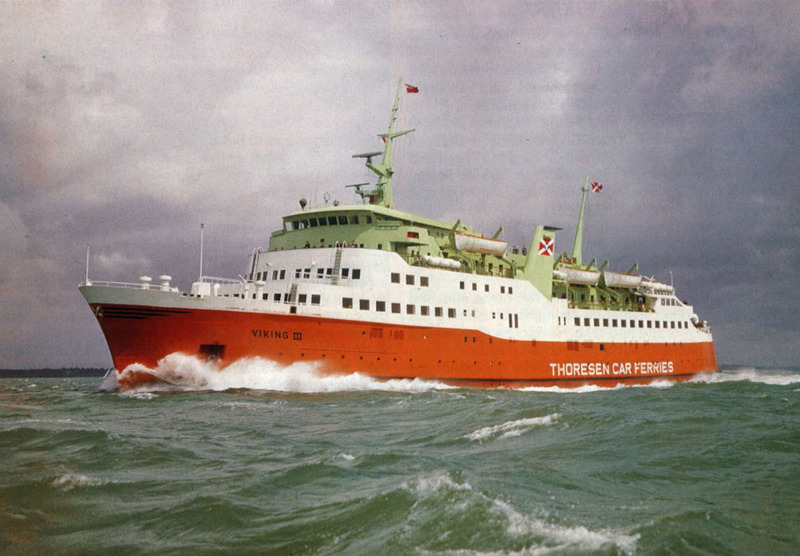 September 28th 1981 – October 15th 1981: Chartered to Sealink Manx Line. Operated between Heysham – Douglas. 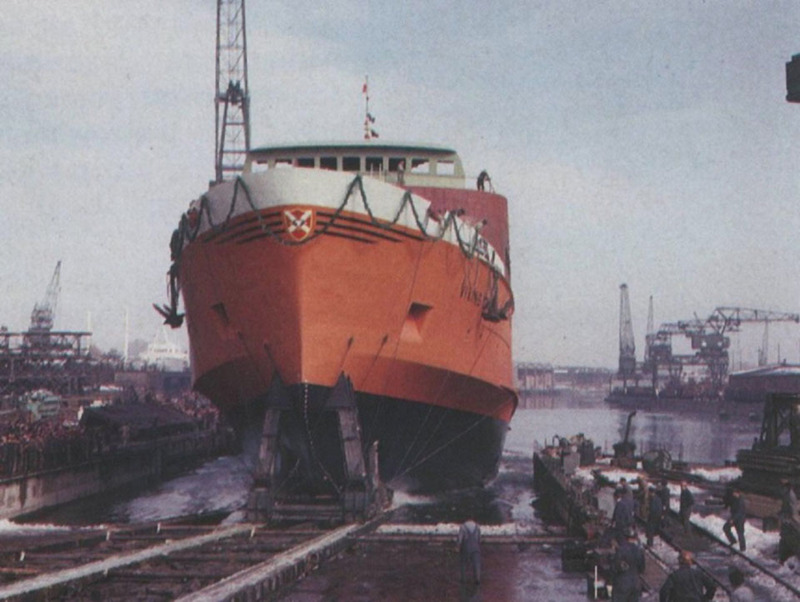 October 1981: After completion of charter laid up in Göteborg awaiting sale. 1982: Sold to Da-No Linjen A/S Oslo, Norway. Renamed TERJE VIGEN. 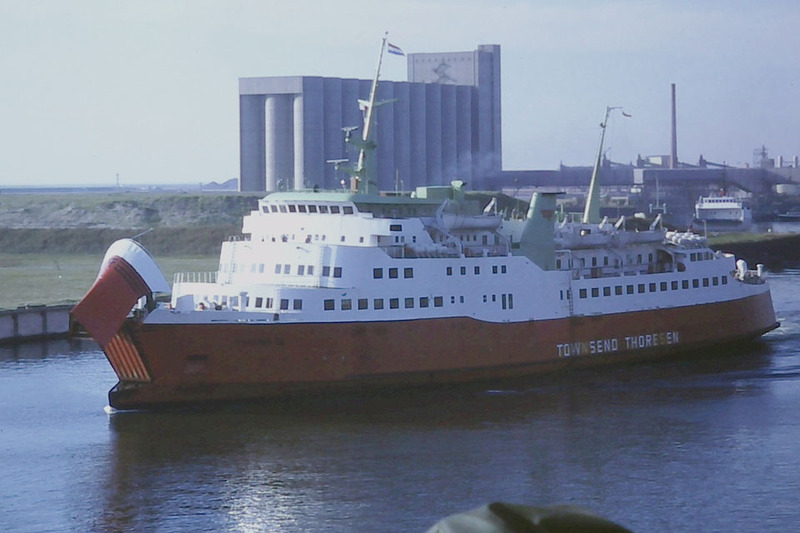 Operated between Frederikstad – Frederikshavn. 1986: Sold to NoRederi Narko A/S, Askimrge. Renamed SCANDINAVIA. May 20th 1986: Chartered to KG-LINE, Kaskö, Finland. Operated between Gävle – Kaskö. 1990: Sold to Hangö Line, Hangö, Finland. 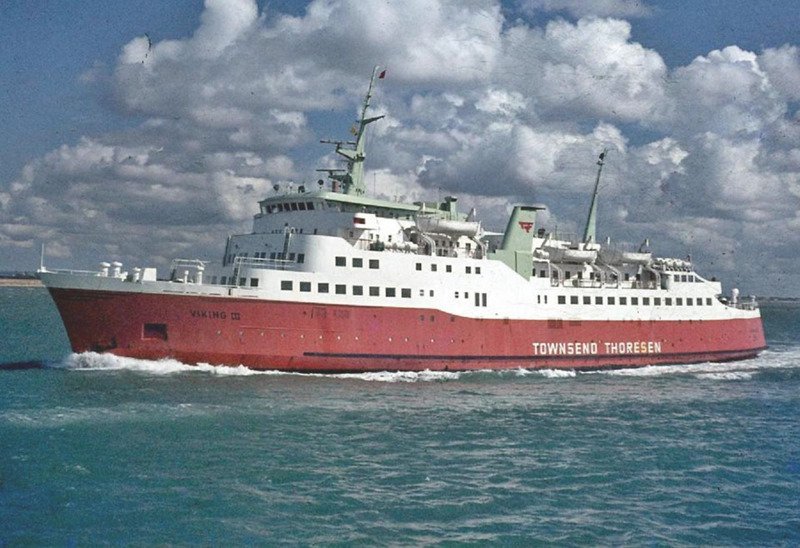 And would have operated between Hangö – Mariehamn – Visby, but the company went bankrupt and the route never opened. February 1990: Sold to Europe Cruise Line A/S, Bergen, Norge. February 1990: Chartered to Vasabåtarna, Vasa, Finland. 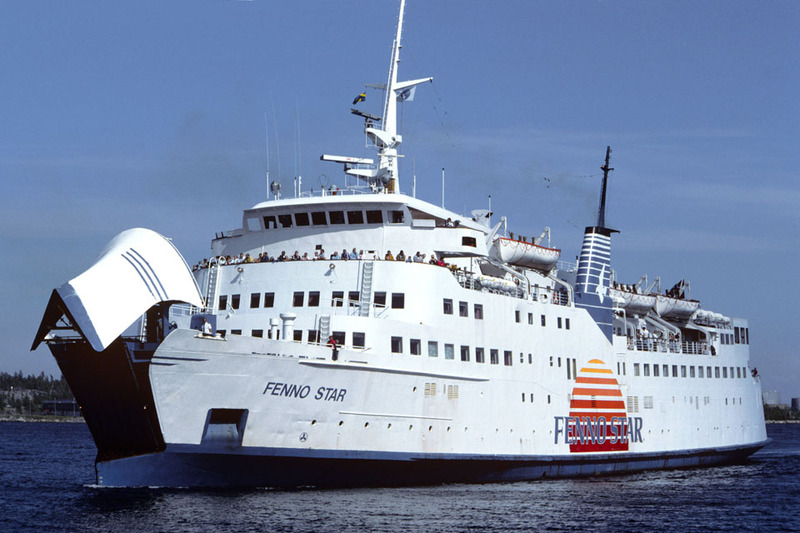 February 14th 1990: Renamed FENNO STAR. 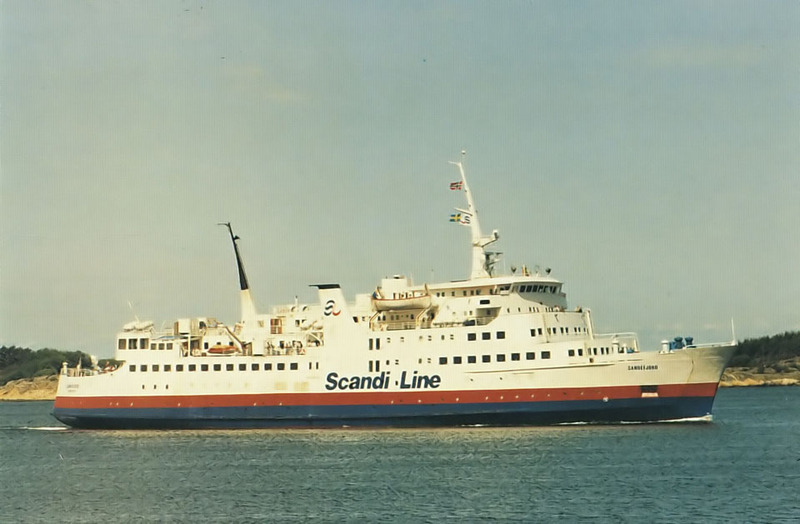 April 1990: Operated between Vasa-Örnsköldsvik. June 1990: Introduced by Jakob Lines between Jakobstad – Skellefteå – Karleby. 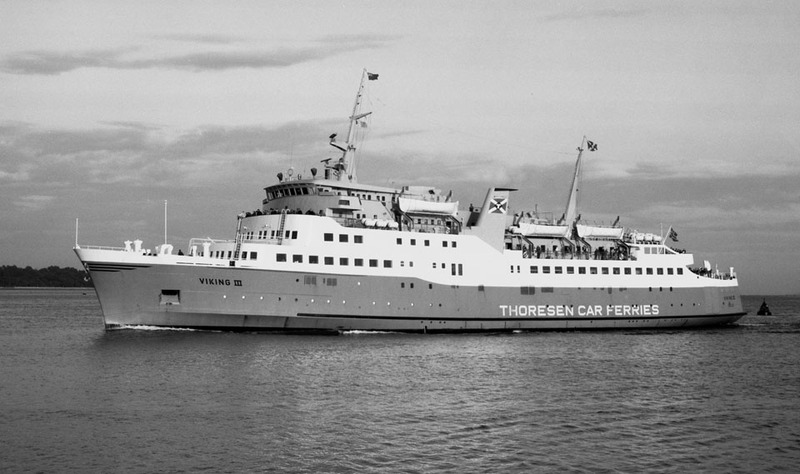 August 1990: Introduced by Vasabåtarna between Vasa – Örnsköldsvik. 1990(winter): Laid up as a refugee ship in Helsingborg. 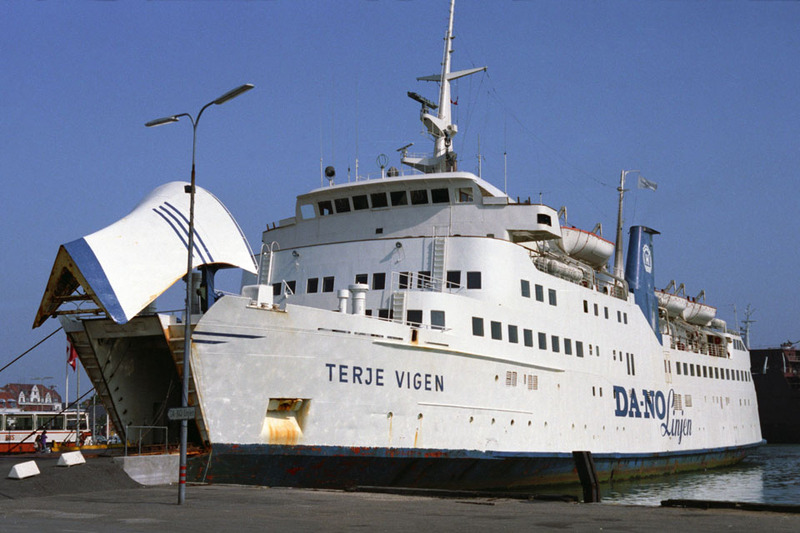 April 1991: Operated between Vasa – Örnsköldsvik. June 1991: Introduced by Jakob Lines between Jakobstad – Skellefteå – Karleby. 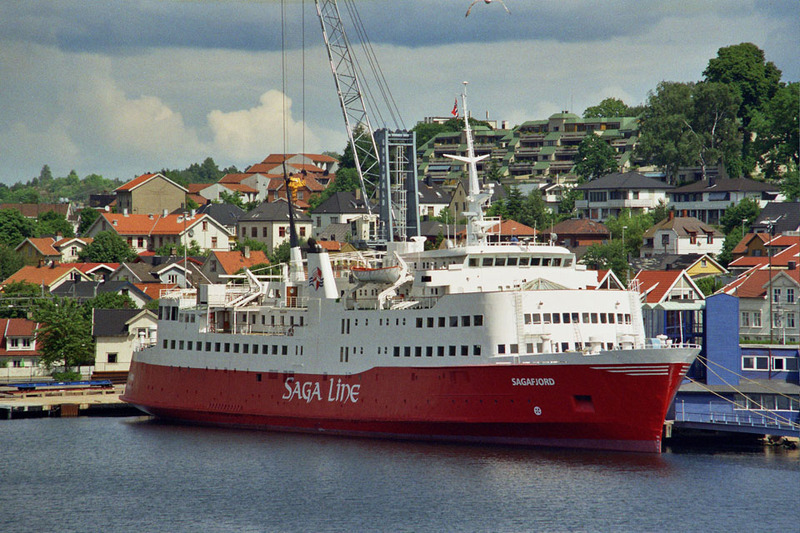 August 1991: Introduced by Vasabåtarna between Vasa – Örnsköldsvik. 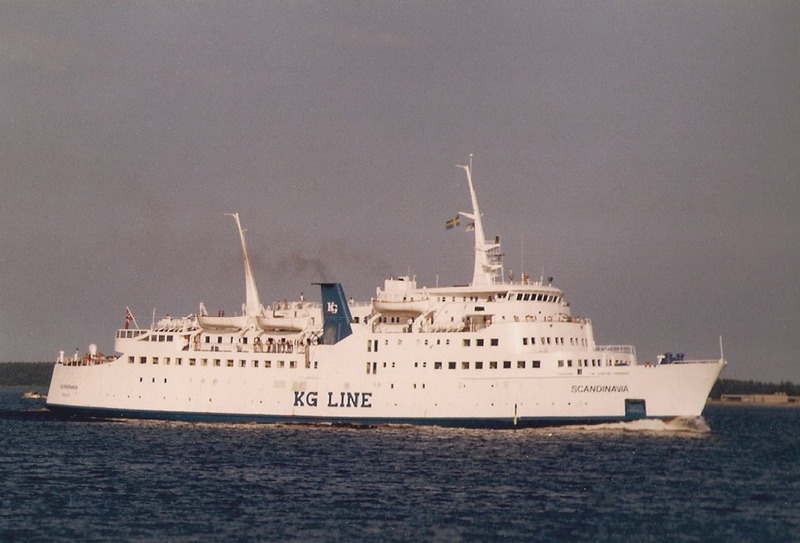 September 1st 1991: Chartered to Polen Ferries for services between Karlskrona – Gdynia. 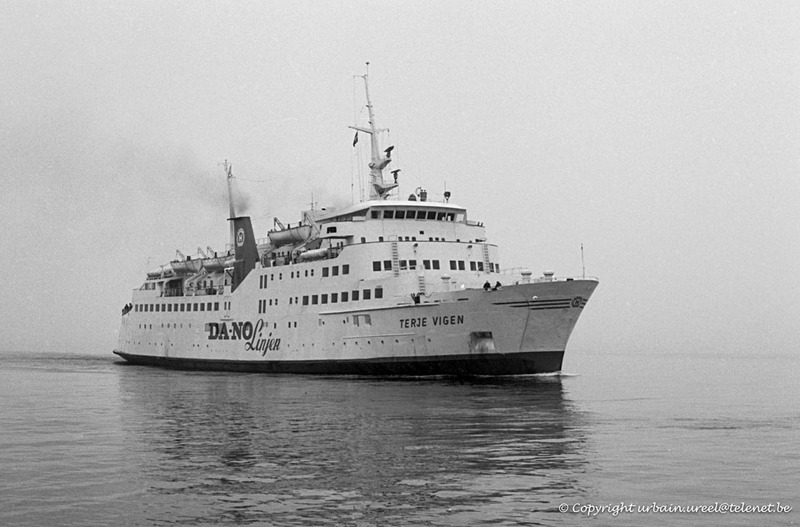 January 9th 1992: Polen Ferries went bankrupt and the vessel was laid up. February 9th 1992 – April 1992: Chartered to Corona Line. Operated between Karlskrona – Gdynia. April 1992: Sold to Koncern Værft A/S, Sandefjord, Norway. Renamed SANDEFJORD. 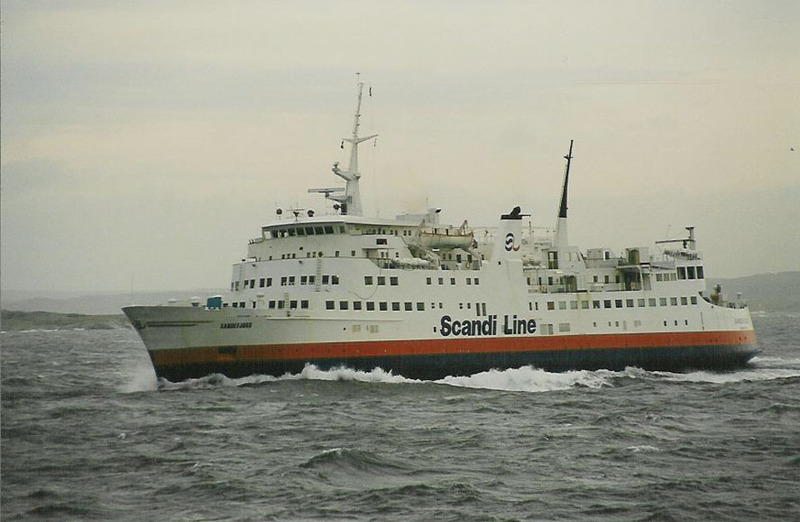 May 8th 1994: Introduced by Scandi Lines between Sandefjord – Strömstad. © Capt Jan Melchers (left) Simplon Postcard and © Pieter Inpyn (right). 1994: Registered to Larvik Scandi Line A/S, Sandefjord, Norway. November 14th 1996: Ran aground outside Strömstad. Passengers evacuated without injury. November 17th 1996: Re-floated and towed to Strömstad, then towed to Drammen for repairs. January 14th 1997: Returned to commercial traffic. January 1st 1999: Registered to Color Line A/S, Oslo, Norway. Operated between Sandefjord – Strömstad. June 2000: Taken out of service and laid up in Drammen as a relief vessel. October 2000: Sold to Los Cipres S.A., Montevideo, Uruguay. 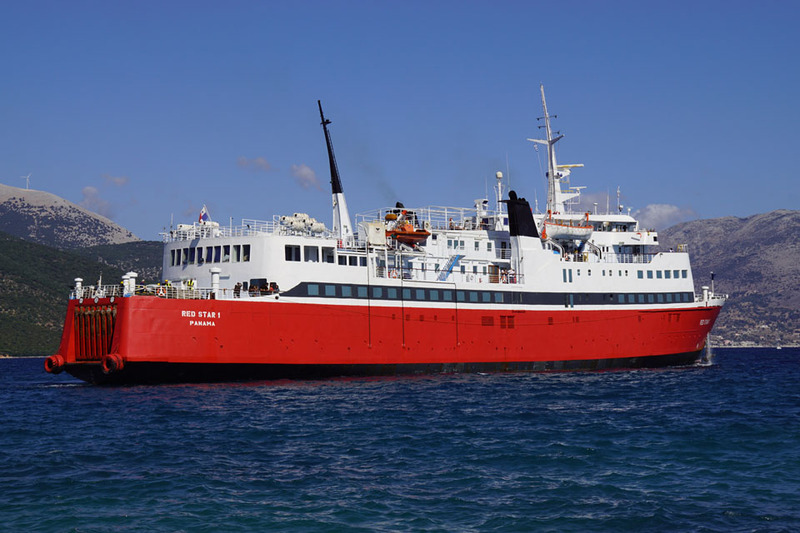 2001: Registered to Buquebus Marshall, Inc, Mahuro, Marshall Island. February 28th 2003: Sold to Saga Linie, A/S, Fredrikstad, Norway. Renamed SAGAFJORD. Planned route between Moss – Skagen. 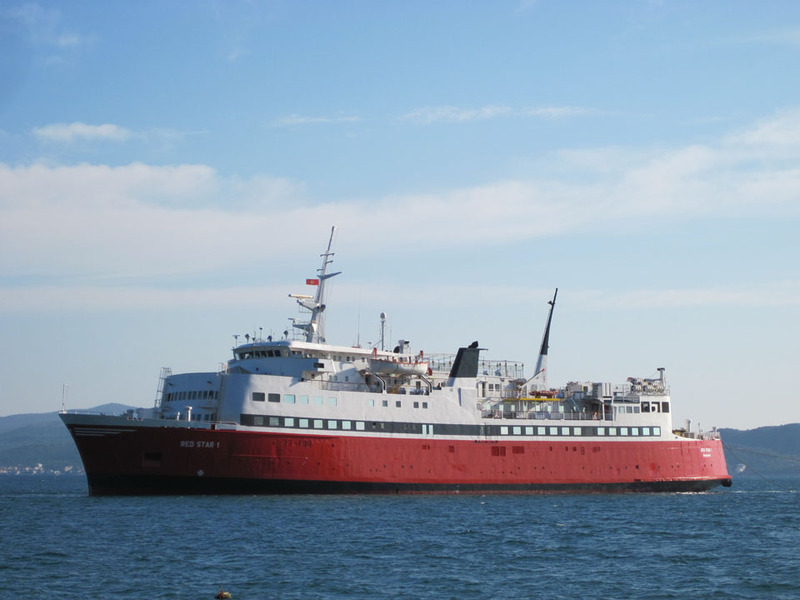 However she ran aground and the Norwegian authorities demanded her condition be improved. 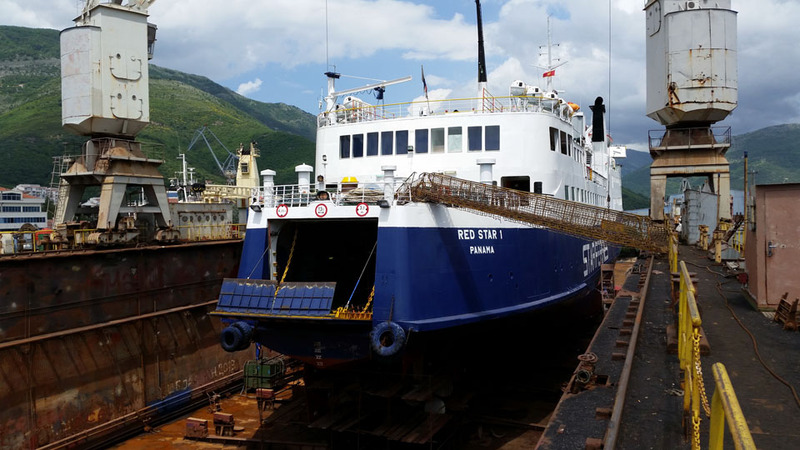 She went for a major refit with estimated return to service later in the year. 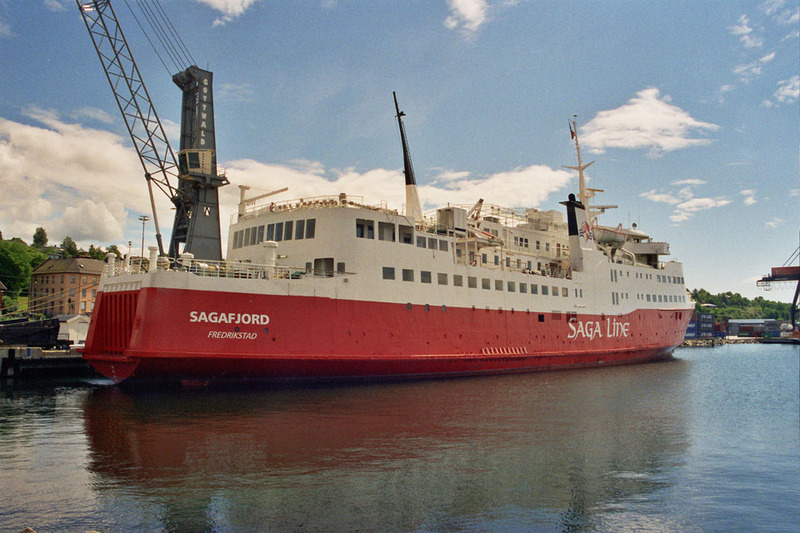 September 20th 2003: Sea trials to Skagen. September 2003: Refit with Ørskov Yard, Frederikshavn, Denmark. October 30th 2003: Arrived in Moss after refit. 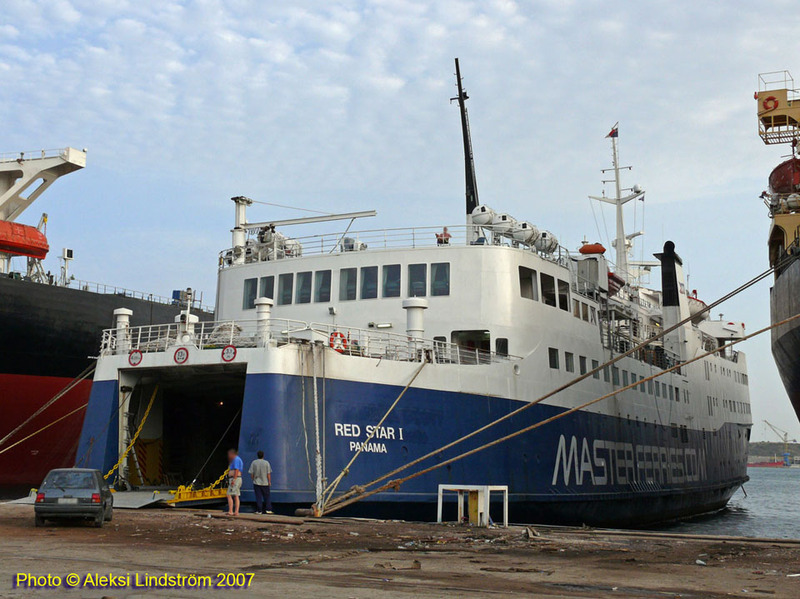 December 2003: Departed from Moss to Remontowa, Poland for replacement of electrical circuitry. March 30th 2004: Arrived in Moss. 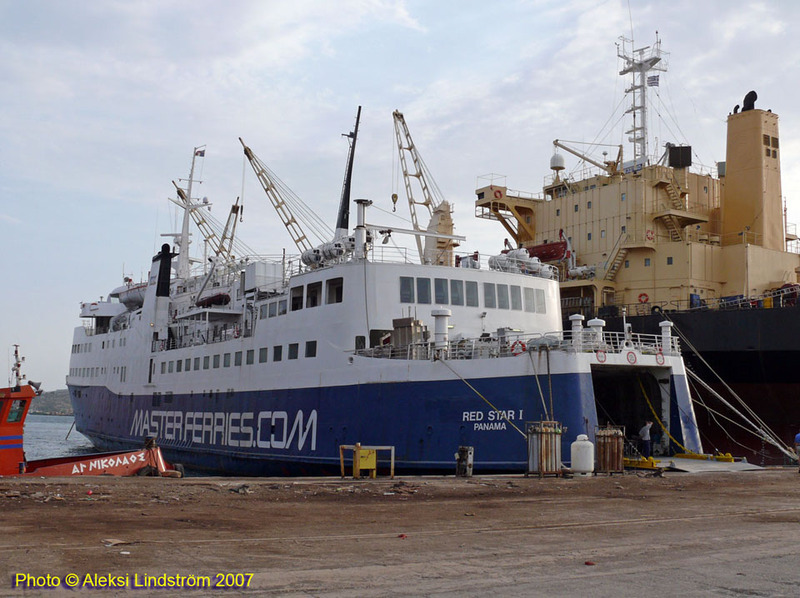 May 15th 2004: Commenced service between Moss – Skagen. October 1st 2004: Owners went bankrupt and she was taken out of service. November 1st 2004: Laid up in Horten. August 11th 2005: Sold to Gabriel Scott Rederi AS (Bernt and Frank Mykjåland), Norway. October 2005: Renamed GABRIEL SCOTT. October 26th 2005: Left Horten for Kristiansand. October 26th 2005: Laid up in Kristiansand. 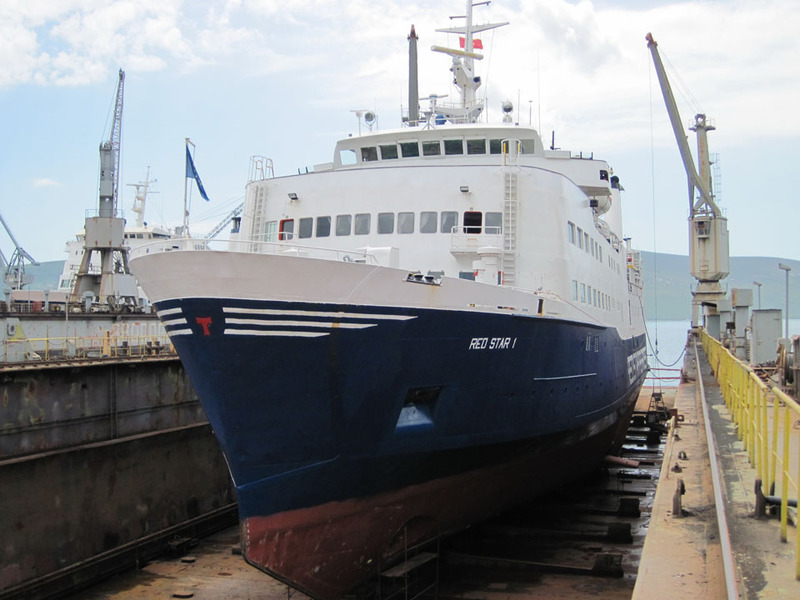 2007: Sold to North Bay Transportes Maritimos Ltd, Panama (Funchal, Madeira, management Gerveni Shipping). 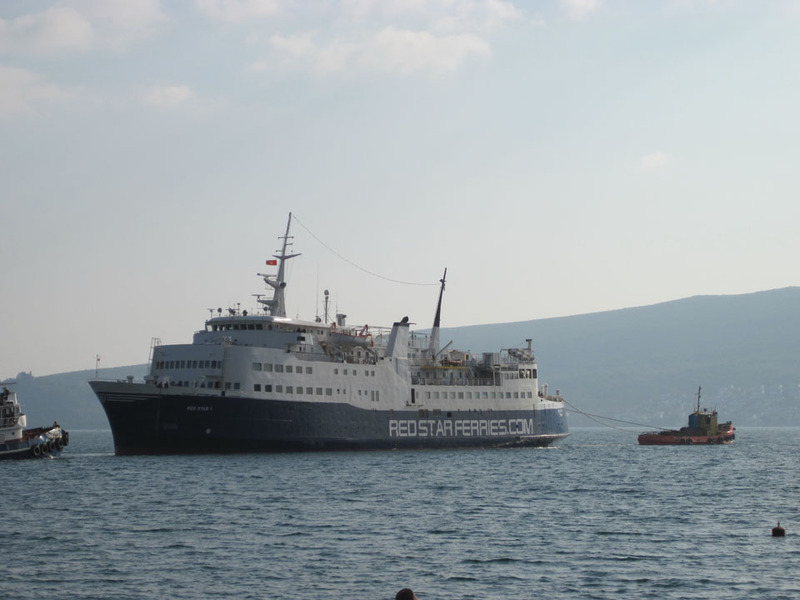 February 29th 2007: Taken over by her new owners and renamed RED STAR I. 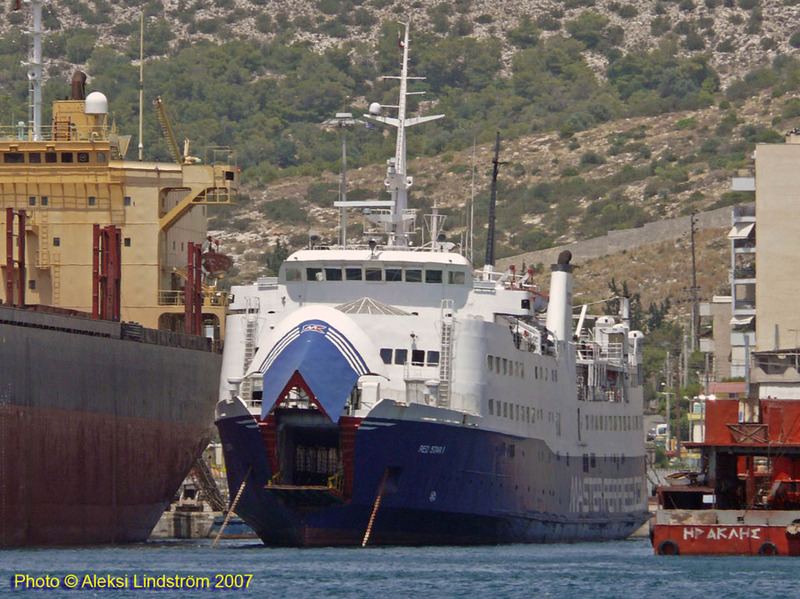 March 22nd 2007: Left Kristiansand for refit in Piraeus. April 12th 2007: Arrived Perama, Greece. July 4th 2007: Left Perama for Durres. 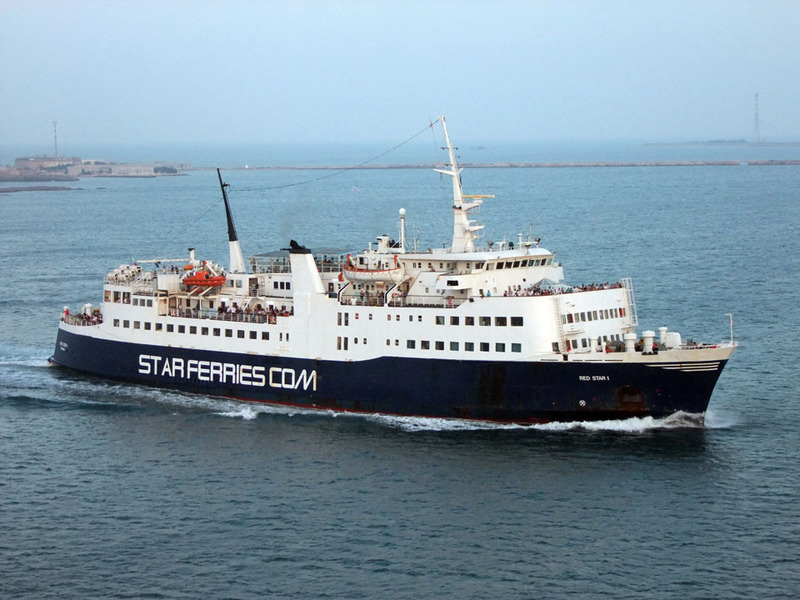 August 2007: Commenced services for Star Ferries between Brindisi – Vlore. March 4th 2011: Arrived Valletta from Brindisi to assist in the evacuation of foreigners caught up in the Libyan Civil War. March 6th 2011: Arrived in Valletta carrying 399 evacuees. March 7th 2011 – March 9th 2011: Left Valletta for a round trip to Sirte. March 10th 2011: Left Valletta for Vlore. April 2011 – May 2011: Chartered to International Organisation for Migration (IOM) again to assit in the evacuation of foreigners from Libyan Civil War. Made a number of trips between Benghazi – Misurata/ Benghazi – Alexandria. May 7th 2011: Arrived Brindisi for services between Brindisi – Vlore. August 25th 2011: Again chartered to International Organisation for migration (IOM). August 29th 2011 – September 1st 2011: Made a single trip between Benghazi – Tripoli. September 1st 2011 – September 5th 2011: Left Benghazi for Brindisi. 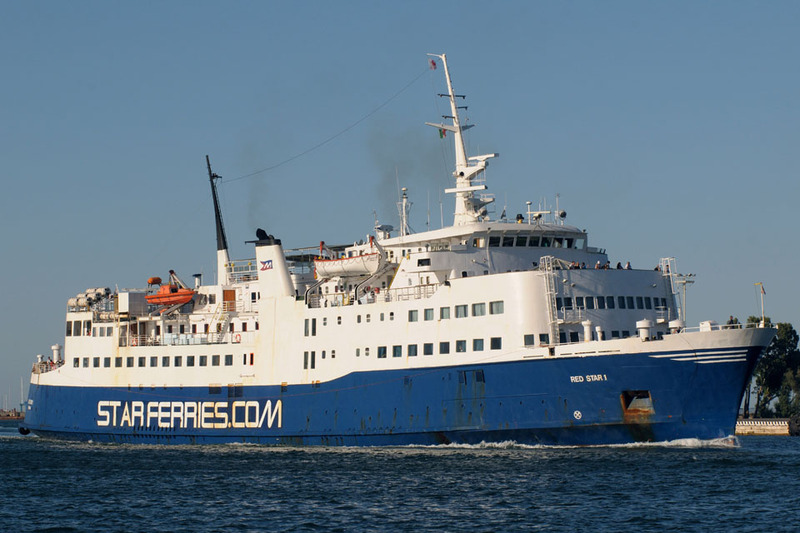 July 8th 2012 – September 11th 2012: Services between Bari – Durres. September 12th 2012: Laid up in Bari. 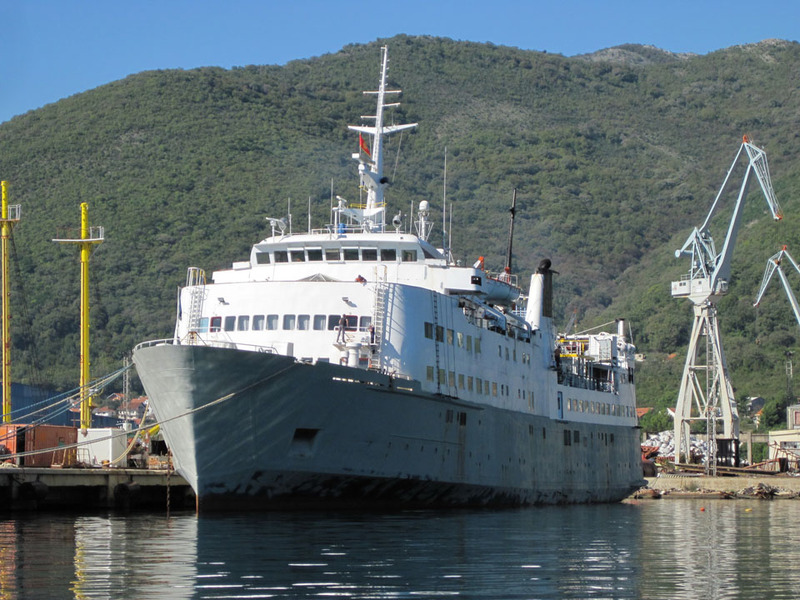 2013: Services between Brindisi – Vlore. 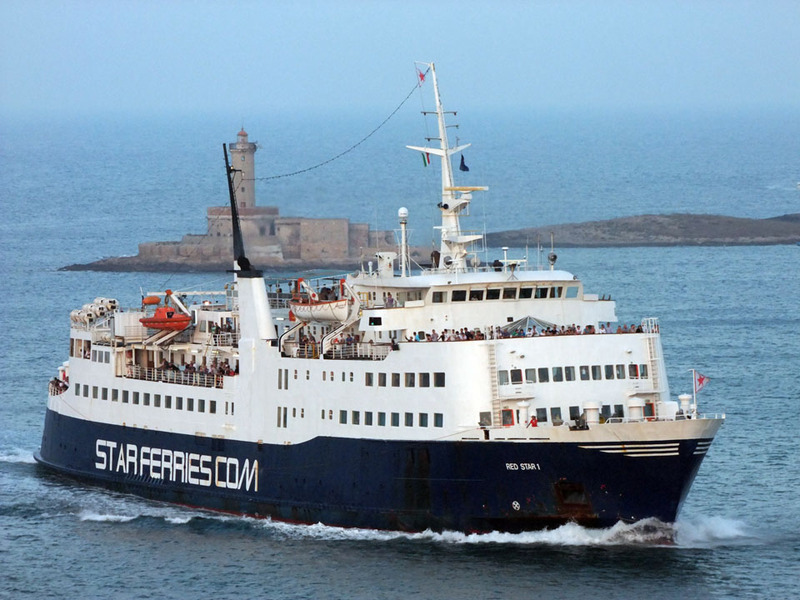 August 11th 2013 – September 8th 2013: Services between Brindisi – Durres. 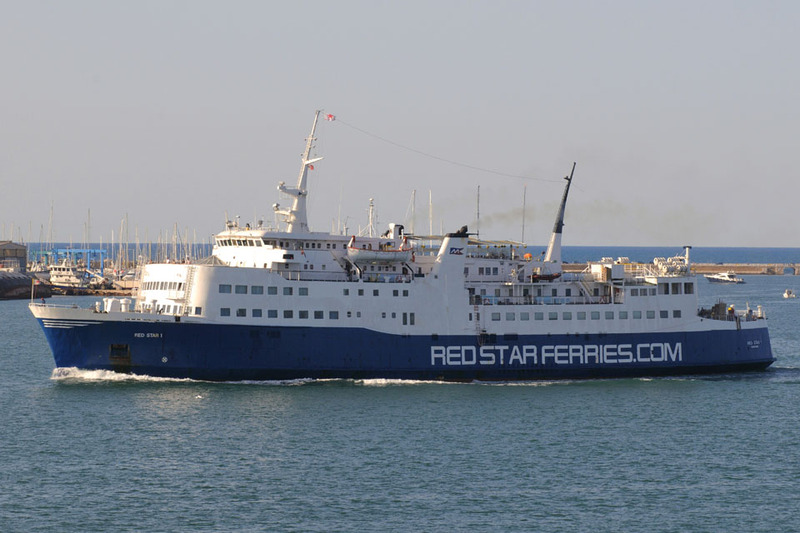 September 2013 – December 9th 2013: Operated services Red Star Ferries/ European Ferries between Brindisi – Vlore. All information is believed to be correct and no responsibility is accepted for any errors or omissions. All items included in this article are subject to © copyright. We would like to take this opportunity of thanking: Malcolm Cranfield, Bernd Crause, Carsten Dettmer, Godra, Frank Heine, A G Jones, Aleksi Lindström, D R Longly, Capt Jan Melchers, Juanfra Monzón, Simonwp, Urbain Ureel and Andreas Wörteler for their assistance in producing this feature.